Your dollar goes further in Arizona. As a result, you purchase more home for the money here. Much more than just large homes, you’re buying beautiful Scottsdale luxury real estate with many amenities including breathtaking views. The lifestyle is what sets Arizona apart in desirability, adding to the extraordinary pleasure of owning a beautiful Scottsdale luxury home. Sunshine, shopping, dining, swimming pools, a myriad of outdoor activities include golfing and hiking, major sporting and entertainment venues. It’s truly resort living year round. Government, research, technology, telecommunications, healthcare and much more. 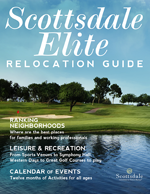 According to CityRating.com, the cost of living in Scottsdale, Arizona is lower than the nationwide city average. An Arizona buyers agent performs services the seller's agent may not, such as provide solid reasons not to buy a particular property; negotiate the best price and terms; include contingencies in the contract for protection, rather than the seller as in most standard contracts; and strengthen the bargaining position of Scottsdale luxury home buyers. Because of their high level of training, they provide expert representation exclusively to buyers to protect their interests with the utmost good faith, loyalty and fidelity. Not just any agent, the Scottsdale exclusive buyer’s Agent ensures full representation and protection for the Scottsdale luxury home buyer. In addition to the comparatively low cost of living in the Grand Canyon State, Arizona is listed as sixth lowest in the nation in property taxes. They’re not based on a fixed percentage of the Scottsdale luxury real estate’s market value, but instead based on the assessed value of the home. Traditionally less than market value, the assessed value of your Scottsdale luxury home can save you more tax money every year, reducing the assessed property value by up to $3,000, with a correlating reduction in property tax. In addition, because property taxes are local taxes rather than state taxes, the community you live in reaps more benefits. Among "America's Best Small Cities for Foodies" by Travelocity. Scottsdale Economic Development won two Golden Prospector Awards. Named among top 50 best places to live in the country by Time. The only Arizona city on the list. Named the No. 4 best mid-size city for millennials, according to travel research website Gogobot. Ranks in top 10 to found a startup outside Silicon Valley and New York. Top city for outstanding customer service, according to YELP Bizzie Awards. Ranked by Forbes among top cities for growth in information economy. Named one of the Valley's healthiest employers (fifth consecutive year). by the Phoenix Business Journal. Ranked No. 1 for an active lifestyle by WalletHub. Captured the 10th spot in Livability.com's list of the "Top Ten Best Places to Retire." Visit scottsdaleaz.gov for more information.